Wearing garb similar to detainees, protesters calling for the closing of Gitmo march in front of the White House this month. Washington (CNN) -- A recommendation by the Obama administration's Guantanamo Detainee Review Task Force to continue holding nearly 50 detainees indefinitely without charges sparked fury among civil liberties groups Friday. The recommendation, confirmed to CNN by two government sources not authorized to release the information, was completed by a task force under the direction of Attorney General Eric Holder and sent to President Obama for final approval. The confidential review recommending a disposition for each of the 196 remaining Guantanamo detainees was first reported by the Washington Post. The review proposes that 47 detainees be held without charges or trial because they are considered too dangerous to release, and because trials could jeopardize intelligence and harm national security, government sources said. "If you close Guantanamo but leave individuals detained without charge or trial you're just making a cosmetic change," said Jameel Jaffer, director of the ACLU National Security Project. 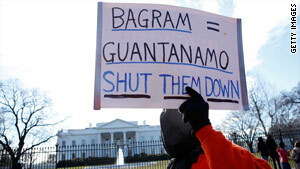 "Today was supposed to be the deadline by which President Obama would close Guantanamo. Now it will be the anniversary of the president's decision to abandon our most fundamental constitutional principles," the center said in a written statement. "If the president accepts the DOJ task force recommendation to hold anyone indefinitely, this policy will not keep Americans safe; instead it will ensure that Guantanamo will continue to be al Qaeda's top recruiting tool," said Tom Parker, Amnesty's policy director for counterterrorism. Federal officials expect to imprison the group to be held under the laws of war in a facility in the United States. If Congress approves funding, the most likely site is a prison in Thomson, Illinois. Lawmakers on Capitol Hill usually allied with the liberal interest groups privately expressed initial reluctance to issue public statements. Public opinion polls show a majority of voters now oppose closing Guantanamo Bay military prison and trying terrorism suspects in the United States. A senior administration official cautioned against concluding that all the task force recommendations will be approved, and said numbers that have been reported may ultimately prove to be wrong. Sources familiar with the report said the task force has recommended 35 detainees face either civilian trials or military commissions in the United States. The remaining approximately 110 detainees -- most of them from Yemen -- are eligible to be transferred to their homeland or a third country once officials determine they can be held securely in their home country or a suitable third country will take them. The recommendations of the Detainee Review Task Force were received on the date Obama set exactly a year ago as the deadline for closing the prison facility at the U.S. Navy base at Guantanamo Bay. The administration now concedes it may be many more months if not longer before the prison can be emptied.